This course will provide students with instruction on the use of digital imaging equipment, software, and imaging enhancement techniques required to successfully prepare evidence for a courtroom presentation. Each day will begin with a review of the topics covered during previous day of training. At the end of each day, there will be a daily review covering the topics discussed during that day. On the last day of training, there will be a final review and students will be expected to complete hands-on exercises covering all of the topics included in the course, from capture to enhancements to courtroom presentations. In addition, each student will also be expected to complete a course critique. This workshop is presented as a combination of lectures, discussions, and hands-on exercises. 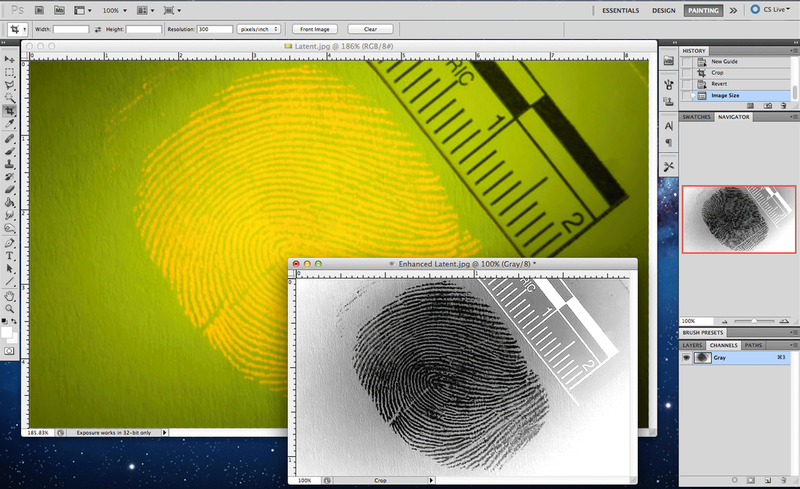 Students will prepare a courtroom presentation of digital images, whether that is a fingerprint, crime scene photo, or so forth. The student will then be required to successfully print an enlargement of their presentation. A laptop computer running the most up-to-date version of Adobe Photoshop CC (If the student’s agency does not use this version of Photoshop, a trial version of the software may be used for the course.) Do not download trial versions more than two weeks before the course or less than one week prior to the course to ensure the software functions properly throughout the duration of the class. Five sample images on which to practice in class. These images should pertain to the type of enhancement the student will perform in real world use of this program. It is requested that the trial version of Adobe Photoshop CC not be loaded any earlier than the week before the start of class as the trial version cannot be reloaded after the 30-day trial period has expired. Booking Info: Call the hotel and mention “Advanced Digital Processing” to receive the special rate or book securely on the Hampton Inn Booking Site.